Despite my best efforts to stay on top of the Jackson restaurant scene, there are some things that simply slip through the cracks. Often times, I’ll justify my delay because they’re working out the new restaurant hiccups. Other times, I’ll pay a restaurant one visit and then put them on the backburner for months at a time. Since I do my best to give a restaurant multiple visits before I write about them that occasionally means that there will be a solid six month span between visits. Of course, there are exceptions to every rule and Mimi’s Family and Friends seems to fall in that category. I remember the buzz when Mimi’s first opened back in April of last year. People were lighting up twitter with 140 characters of funky Fondren atmosphere, Gulf coast cuisine, and a genuinely friendly staff. It all sounded great, but instead of jumping in my car and enjoying some of the Fondren uniqueness over lunch, Mimi’s quickly slipped onto the “must visit” list on my phone. After a few months of procrastination, I decided to, as I hope will be the case for most every restaurant in Jackson, put my excuses behind me and finally give Mimi’s Family and Friends a try. Situated in what I think was once a dry cleaner, Mimi’s certainly has a unique air about it. It’s not a large location as tables and chairs seem to be situated wherever there is space. A bare spot on the wall is hard to come by as nearly every square inch is filled with art for sale or just for decoration. While there may not be a cohesive theme to the artwork, it certainly creates a unique atmosphere to Mimi’s. While the menu does have a bit of seasonality to it, the majority is a mix of simple but satisfying dishes. Since my first visit came before the icy grip of winter had set into Jackson, there was still a remnant of summer on the menu. That last gasp of warm weather came in the form of Heirloom Tomato Soup. Actually, I originally ordered a cup of the Duck and Sausage Gumbo, but it was sold out for the day. I can appreciate the idea of making food fresh and just enough for that day, but I really wanted that damn gumbo. 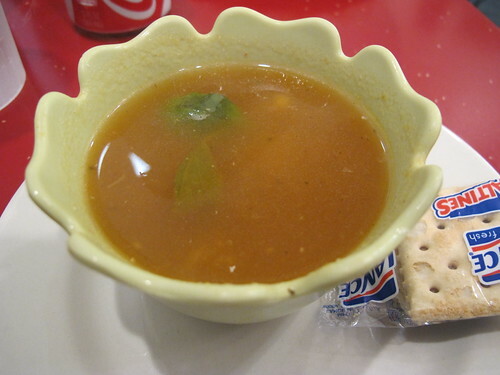 This was more like a tomato consommé than a bowl of soup. 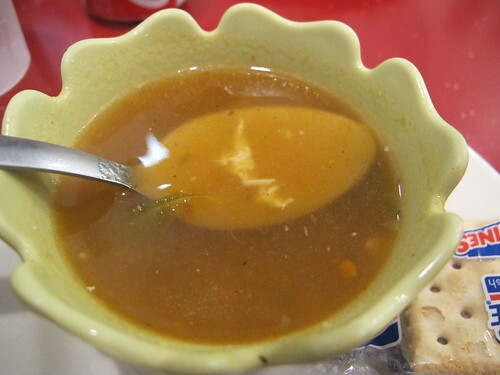 Thin and with a clean, almost subtle tomato flavor, it was far from the thick cream thickened tomato soup that I was expecting. Still, you have to like that single basil leaf floating in a sea of tomato essence. Looking for something a little meaty to make up for the wafer thin starter, The Pressed Cubano on Cuban Bread seemed like an excellent choice. Well, it certainly had the look of a pressed Cuban sandwich; I was extremely surprised to find the initial taste was of honey mustard. 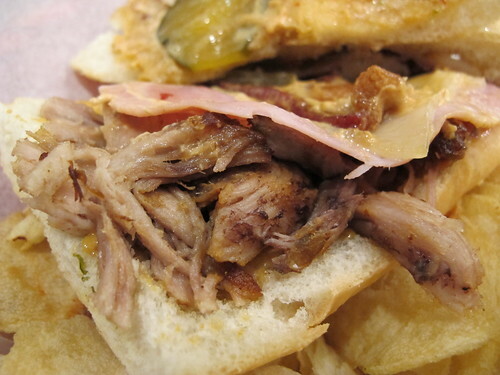 Honey mustard on a Cuban sandwich, something seems amiss. 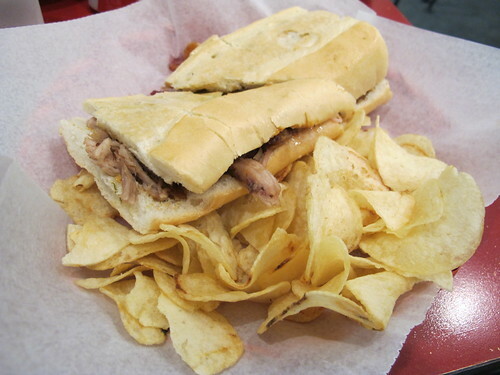 Beneath the crispy Cuban bread was a mélange of meats. Bacon, pulled pork, and ham, it was a porcine extravaganza. Unfortunately, outside of the dry pulled pork, no particular flavor shone through. With each bite, I kept waiting for the bite of a pickle or the acidity of mustard to break through wall of pork flavors, but no such luck. 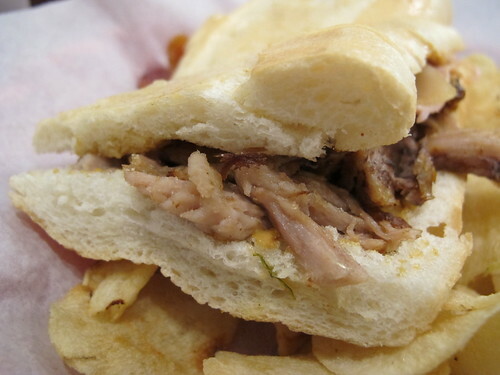 While some people might enjoy the taste of a pure pork sandwich, one of my favorite things about a good Cuban sandwich is how each component’s flavor can both show their own virtues and work as a cohesive unit. It’s hard to judge a restaurant based on one visit, and that’s why I do my best to give a place at least two if not three separate chances. Usually the second and third visits just reaffirm the results of the initial visit, but there are exceptions. The second meal at Mimi’s was one of those exceptions. 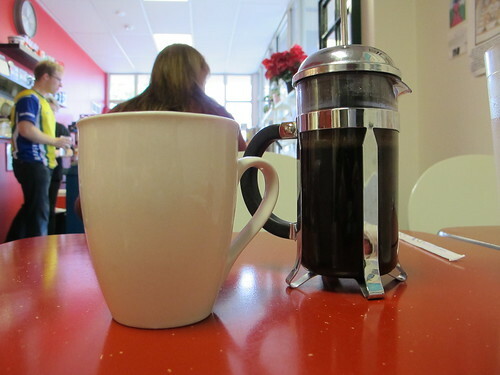 There is one topic that I have to give credit to Mimi’s and that’s with their coffee. It may be a small, fiddly touch, but I love coffee made through a French press. 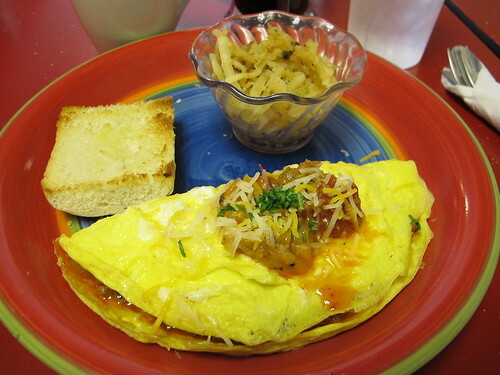 Forgetting the coffee, the real highlight of this visit was the Spanish Omelet. I realize it may look like you average omelet, but there was a fair amount of skill put to use with this one. Beneath the tender, flaky exterior was an overflowing stuffing of slightly smoky chorizo and a duet of caramelized onions and tender peppers. 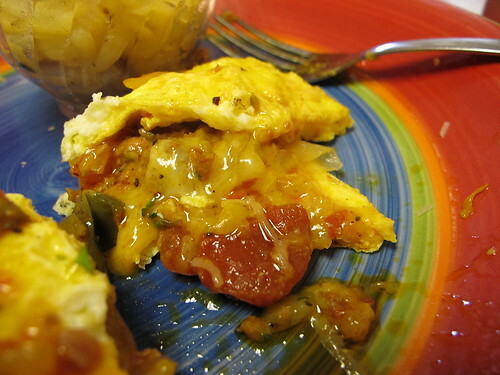 Yes, the whole ordeal may be a little on the greasy side, but that’s the price you pay for chorizo and omelet excellence. 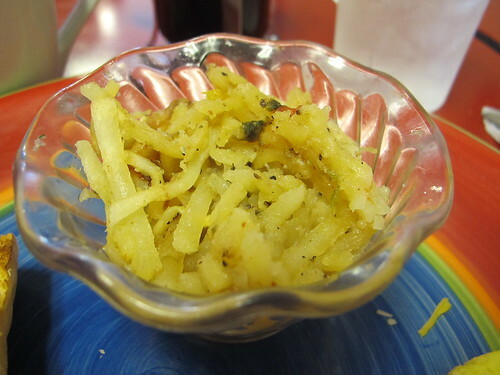 As for the side of hash browns, I had mixed feelings about the cup of shredded spuds. Hash browns are a always a nice breakfast addition but I missed the crispiness of pan fried hash browns. Outside of that, they were well seasoned and added a new layer of spice to the plate. Hoping to maintain some level of decorum after the excesses of the Spanish omelet, I decided to save the Krispy Kreme Bread Pudding for another time. However, you should never underestimate the pull of a Krispy Kreme based dessert. A few days later I was back at Mimi’s and ready for a life affirming/threatening dessert. Looking through the menu, I rationalized that I couldn’t eat just an order of bread pudding for lunch. 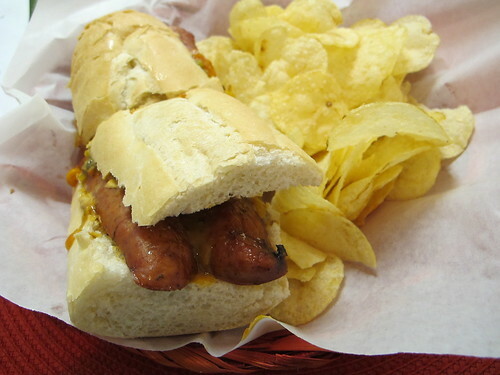 So I decided to do the sensible thing and order the Smoked Sausage on Cuban Bread with Garlic Chipotle Aioli, Peppers, and Onions. Yes, that’s a completely sensible choice isn’t it? 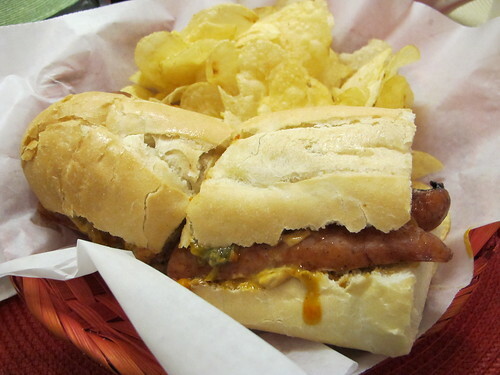 Well, considering the cold day outside, a spicy sausage sandwich seemed like an excellent idea. Inside this sandwich is a rather mundane split sausage. There’s nothing wrong with Country Pleasin’, it’s an ok brand of sausage, but that’s not the point here. The sausage well cut in half and split lengthwise and it was quite well cooked, but it was the rest of the sandwich that really pulled everything together. 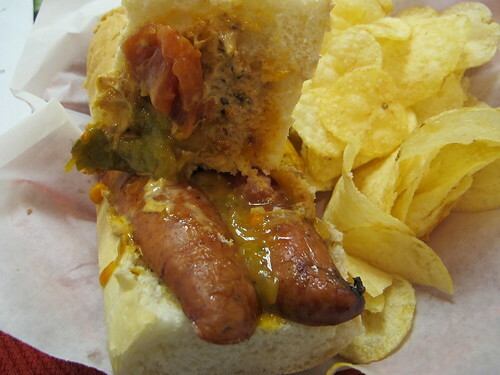 Each bite was a mix of spice from the sausage and the creamy richness and subtle spiciness of the Chipotle aioli. It may not have been the most complex sandwich, but it was entirely satisfying. Unfortunately, I was left high and dry with the bread pudding. Apparently there is some credence to the method of ordering your dessert with your entrée. The last portion had been sold just a minute before I ordered. Fighting the urge to either slump in my chair and cry or have a violent outburst and steal a French press, I decided to hope for better luck next time. After a mediocre first visit and the exceedingly pleasant second and third, I’ve come to really enjoy what Mimi’s Family and Friends has to offer. It’s a little offbeat, but entirely approachable, a lot like the Fondren neighborhood. Their food may not be groundbreaking but it’s a quality product that will leave you satisfied and isn’t that the point? I've eaten breakfast at Mimi's once and was not impressed, so it's nice to hear it improved for you over subsequent visits.